One of the many abandoned homes outside Ogallala, Neb. The welcome sign in Ogallala, Neb., population 4,500. 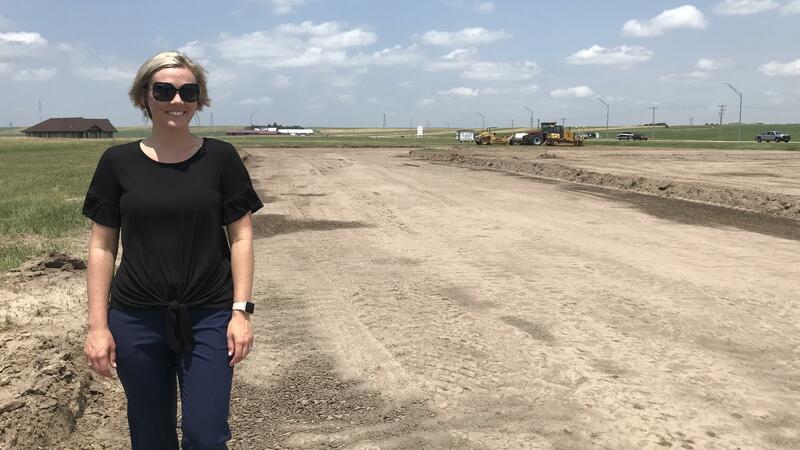 Mary Wilson, director of the local economic development office in Ogallala, Neb., visits the site of a new subdivision on the prairie north of town. "My role as the economic development director is bringing business and industry to town, retaining the business and industries that we have, doing what I can to expand that tax base," Wilson says. "It's difficult to do that when we don't have adequate housing." This is the classic "chicken and egg" that has long plagued rural America, but the problem is being magnified now by the housing shortage. Nationally, housing economists lay blame on a number of things, including the high price of lumber due to new tariffs on Canadian wood. There's also a labor shortage — after the 2008 housing collapse, construction workers left the trades in droves. Doug Davis, a longtime local real estate man and developer, says it's even worse in small towns. He says there's easily enough demand in Ogallala to build and sell 40 new houses in the next few years. For now, he's just proud to have built three recently. "In the bigger cities, you [at least] have a selection," Davis says. "I couldn't go out and get five bids on a plumber to do this house, because they're all busy." A lot of the contractors who are here are getting older and close to retirement. That slowed construction significantly on a 1,300-square-foot home Davis recently built and sold in the center of town. Marketed as workforce housing, the home has modern, higher-end furnishings and is considerably more energy efficient than much of the town's aging housing stock. "The longest I've ever had a house up for sale has been probably three weeks," Davis says. "Most of my houses are sold before they're done." That latest sold for $178,000. That's a lot of money in Ogallala, where wages are depressed because of agriculture commodity prices. Longtime locals are "aging in place" here, but there is also an influx of newcomers driving up prices. Retirees are moving to the area from higher-priced cities in the region. People are also drawn by the town's proximity to a popular boating reservoir and more generally to its small-town feel, including a vintage movie theater and downtown shops that still sell practical items. "Prices have gone up quite a bit in this area from the influx of people from Denver buying second homes or retiring out here and willing to spend a little bit of money," says Joe Kempton, a physical therapist at the community hospital. Kempton moved to Ogallala from the Phoenix area two years ago. Initially, he had to rent an apartment before moving the rest of his family here because they couldn't find something suitable in the $200,000 range. "They jump up to $350,000 pretty quickly up here, which was astonishing," Kempton says. After a year of looking, they finally decided that building their own home made more sense. One of Kempton's co-workers at the hospital, a nurse, is commuting 50 miles one way from North Platte because she can't find a small home to buy in Ogallala. The hospital's director said the lack of adequate — or even available — housing is the main impediment to attracting and retaining quality workers. 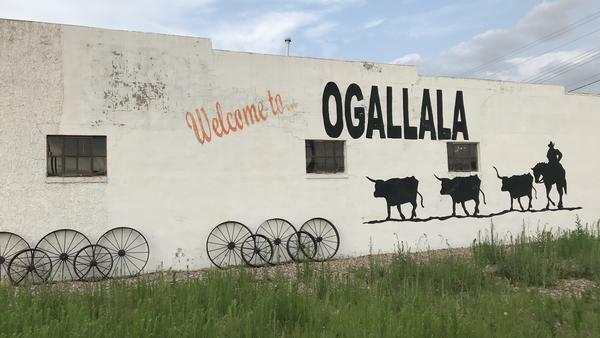 The easiest answer for a town like Ogallala is to just build more, right? But small towns like this are still considered risky investments by most outside developers. They can make a lot more money in cities where land and home values are even higher. Ogallala is learning this the hard way. Recently, the town struggled to find capital to redevelop a shuttered middle school into condos and apartments, to help ease the shortage. "In rural Nebraska, you don't typically have tons of seed money just lying around waiting for a project to come across its door," says Jacob Hovendick, a local financial adviser and CPA. Hovendick's extended family is from Ogallala and he jumped at the chance to move here five years ago from Lincoln and raise his young family. The shortage of adequate or even available homes has clearly led to some soul searching. "We're at a really pivotal point in rural America's development because you now are finding opportunities through technological advancements to be mobile as a workforce, to work from home for a company three states away," Hovendick says. As he sees it, rural America is close to rebounding but is stymied because there are so few places to live. So Hovendick and other business leaders are behind a plan to ask voters this fall to approve a reallocation of local sales tax. The money would be used to build more workforce housing and offer incentives for developers to come here. "The federal government is not coming to help us; the state government to a certain extent can't come help us," Hovendick says. "No one's coming to our rescue. We have to start helping ourselves." Nationally, rural housing experts say the same thing. You have to have a well-organized local group of leaders committed to raising money and getting things done, in this era where federal funding for rural development is trending down. To that end, Mary Wilson, the local economic development officer, is eager to show off a new subdivision sprouting up on the prairie north of town, near the hospital, which she says could serve as starter homes for nurses and other professionals there. The developer saw the need and decided to come in and build four new duplexes on his own. Even this project is way behind schedule, because of the labor shortage. "We wanted to break ground up here on April 21st," Wilson says. Wilson, who grew up in an even smaller town in western Nebraska, says rural America has suffered from a confidence problem for too long. If you hear over and over that you're withering away, you start to believe it. "Some people out there have the perception of Ogallala drying up and dying," she says. "We're not that at all." To hear people in Ogallala tell it, the national housing shortage is more a wake-up call than a crisis for rural America. Home prices are skyrocketing in some places that might surprise you, including remote towns in rural America. And the problems facing those places may be especially hard to solve. 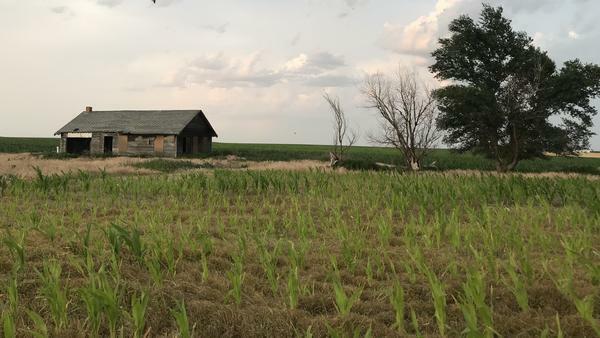 As part of our series on the new housing crisis, NPR's Kirk Siegler sent this report from rural Nebraska. SIMON: Along the country roads that fan out from the Ogallala, Neb., there are abandoned, old farmhouses and weathered, caved-in barns - a remnant of the hardscrabble settlers who first tapped the Ogallala Aquifer, turning these dry, high plains into lush wheat and corn fields. Like a lot of the rural heartland, Western Nebraska slowly emptied out over the years. KIRK SIEGLER, BYLINE: So why then is there a housing shortage today in Ogallala, population 4,500? The answers are complicated. But if you ask Mary Wilson, she'll tell you it's more like a shortage of adequate housing. MARY WILSON: People aren't updating their homes before they throw them on the market. People are living in their homes, I think, longer here. SIEGLER: On average, people are living in their homes twice as long as they did before the Great Recession. So the market is tight. When Wilson moved to Ogallala from Colorado, drawn back to the small-town Nebraska she grew up in, she and her husband had a hard time finding something suitable. WILSON: You know, we had to settle for what was available. SIEGLER: Wilson is in charge of economic development here. She's driving down a quiet, leafy street of larger old homes in the center of town. They were built for a far different time when you needed big families to work the farms. A lot of them now are outdated. The few that are for sale need 40 grand worth of rehab at a minimum. And most people either can't or aren't willing to pay that. WILSON: My role as the economic development director is bringing business and industry to town - retaining the business and industries that we have, you know, doing what I can to expand that tax base. Well, it's difficult to do that when we don't have adequate housing. SIEGLER: This is the classic chicken and egg that's long plagued rural America but is being magnified now by the national crisis in the housing industry - a crisis blamed on lots of factors. Lumber is hugely expensive due to tariffs on Canadian wood. And there's a labor shortage, made even worse in an isolated small town like Ogallala. Doug Davis is a longtime local real estate man and developer. DOUG DAVIS: In the bigger cities, you have a selection. I mean, I couldn't go out and get like 5 bids on a plumber to do this house because they're all busy. SIEGLER: And a lot of the contractors who are here are getting older and looking to retire. DAVIS: I think the need is there. If we could build 40 houses in the next two to three years, we'd sell more. SIEGLER: For now, Davis is just proud to have gotten three homes built - no small feat in a town that hadn't had a new private home put up since the 1990s. And they sold in less than three weeks, one even before it was finished. DAVIS: I tried to make it, so it all flows. You know, like I said, it's 1,300 square foot. SIEGLER: Now this place closed at just under 200,000. That's a lot in Ogallala where wages are depressed from the boom and bust of farm commodity prices. The few other homes on the market right now are mostly selling north of 300,000 too. As in a lot of smaller markets, newcomers are driving up prices. DAVIS: Yep, the folks I sold the house to next door are from Denver. And they just got tired of the Denver hassle. The houses I'd built up on 10th Street, I think that was a win-win situation because those were all three people that came from outside the community. SIEGLER: Now, the easiest answer is just to build more homes. But small towns like this are still considered risky by most outside developers. They can make a lot more money in cities where land and home values are even higher. Ogallala is learning this the hard way as it struggled to find capital to redevelop a shuttered school into condos to help ease the shortage. JACOB HOVENDICK: In rural Nebraska, you don't typically have tons of seed money just laying around waiting for a project to come across it's door. SIEGLER: At Adams Bank and Trust downtown, I met Jacob Hovendick. He's a financial adviser and accountant. His extended family is from here. And he jumped at the chance five years ago to move over from Lincoln and raise his young family. Now, the shortage of adequate or even available homes has clearly led to some soul-searching. HOVENDICK: I feel like we're at a very pivotal point in rural America's development because you now are finding opportunities through technological advancements to be mobile as a workforce - to maybe work from home but work for a company three states away. SIEGLER: Hovendick says rural America is so close to rebounding, but now there's no place to live. So he and other business leaders are behind a plan to ask voters here this fall to approve a small sales-tax hike. The money would be used to build more workforce housing and offer incentives for developers to come here. HOVENDICK: The federal government's not coming to help us. The state government, to a certain extent, can't come help us. No one's coming to our rescue. We kind of have to start helping ourselves. SIEGLER: Nationally, rural housing experts say the same thing. You've got to have a well-organized local group of leaders committed to raising money and getting things done, in this era where federal funding for rural development is trending down. WILSON: Just watch for rattlesnakes. SIEGLER: That's only a half joke for Mary Wilson, who just hopped out of her SUV on a dirt road north of Ogallala. Campers and boaters are whizzing by, headed to nearby Lake McCaughnay, lately a big economic driver. WILSON: So they started moving dirt last week to prep this site for this new development. SIEGLER: Wilson wanted to show me this site because a Nebraska developer, on his own, saw the need and decided to come in and build four new duplexes. WILSON: The cul-de-sac here, this is an entire subdivision. The developer bought this entire subdivision. SIEGLER: She hopes these starter homes will help the local hospital in particular attract new doctors and nurses. Wilson, who grew up in an even smaller town near here, says for too long rural America has suffered from a confidence problem. If you hear over and over that you're withering away, well, you start to believe it. WILSON: Some people out there have the perception of Ogallala drying up and dying. And we're not that at all. SIEGLER: To hear people in Ogallala tell it, the housing shortage is more a wake-up call than crisis for rural America. Kirk Siegler, NPR News, Ogallala, Neb. [POST-BROADCAST CORRECTION: In this report, we state that voters would consider a small sales tax hike. In fact, the proposal is to reallocate existing sales tax funds.] Transcript provided by NPR, Copyright NPR.